Dan Geib provides free bluegrass guitar lessons and free bluegrass guitar tabs for flatpicking guitar players and bluegrass guitar players. 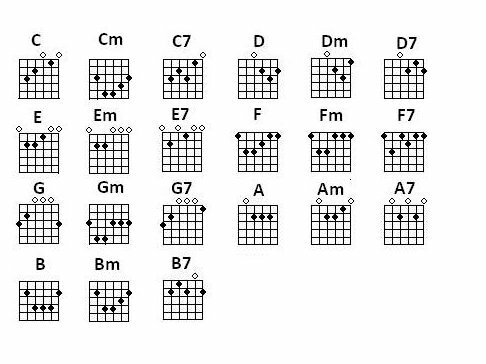 Bluegrass guitar chords, bluegrass tabs, bluegrass scales and bluegrass licks are here. LICKS FOR BLUEGRASS SONGS . CLICK HERE! Thank you for making this material available at such a reasonable price. If you put together a second package like this one, I'll certainly be interested. Good Practice Habits. 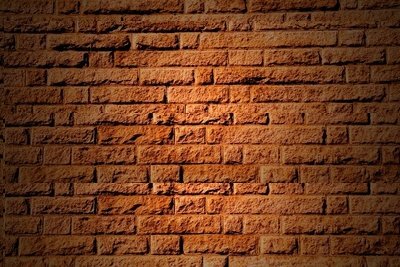 * Basic Bluegrass Guitar Rhythm. 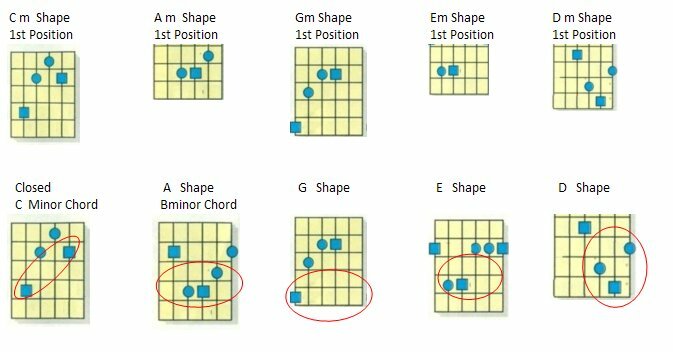 * Nashville Number Charts. * Practice Smartly. Locate problem areas and work them over and over. Its not unusual to practice a phrase 20 or 30 times. You need to build brain and muscle memory into your hands. Repetition is the only way. * Record yourself and listen. * Play Slowly and cleanly until you have not only the notes but a solid groove. * Play fast. Even though it will not sound great at first, don't worry, eventually your brain and hands will get in sync and things will start flowing. If you dont work on it, speed will never happen. No one ever got fast by playing slow. * Practice Relaxed. Stiff arms and shoulder will equate to sore arms and muscles and your playing will not flow. * Sing your notes in your head. Sing/hum the scale tones or solo notes as you play them. Let your inner ear hear it. * Set a schedule for your practice. Try to practice same time every day but if you cant, find an hour a day at least. Set expectations and goals. * Use good posture. Wear a strap. If you plan to perform, practice standing up. Big difference between sitting in the chair and standing on the floor. * Loosen up a bit before you begin. Stretch your arms, fingers and hands. Relax. In this system, the scale tones are refered to as numbers instead of the note name. Here are three ways the G Scale can be communicated. 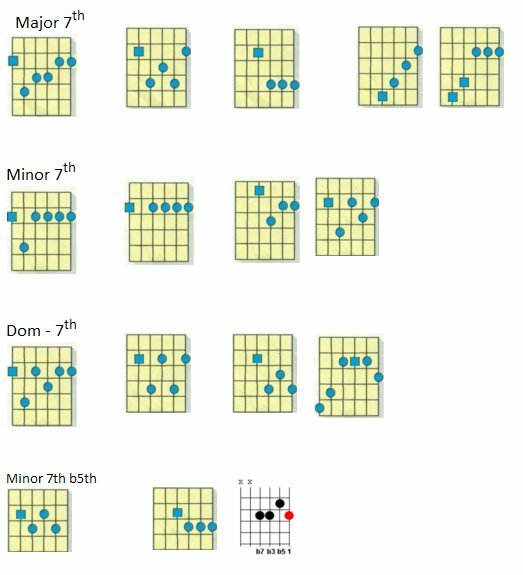 way around the fret board and create create guitar solos. 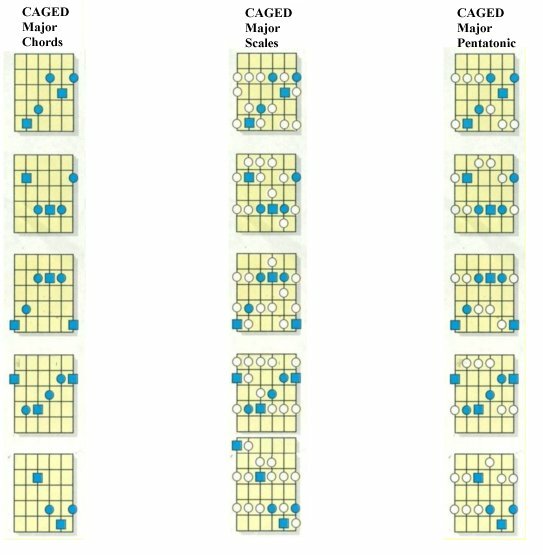 The "CAGED" system and its related chords. 1st fret and B is just an A shape barred at the 2nd. 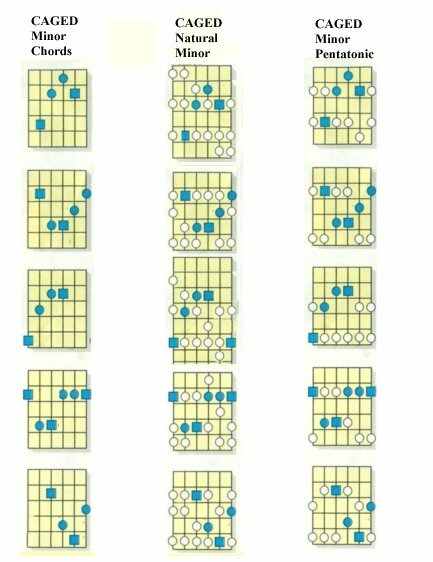 So let�s have a look at the major chords of C, A, G, E and D.
Here�s how to think about the fretboard notes to line up those chords. 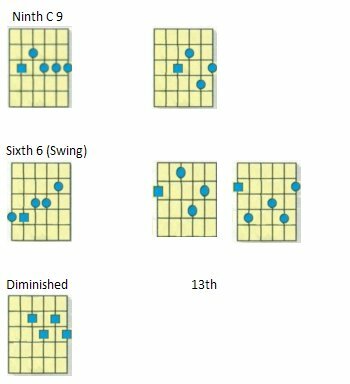 each chord. It�s important that you learn these so that you don�t need to think about them. On the right is CAGED minor pentatonic. 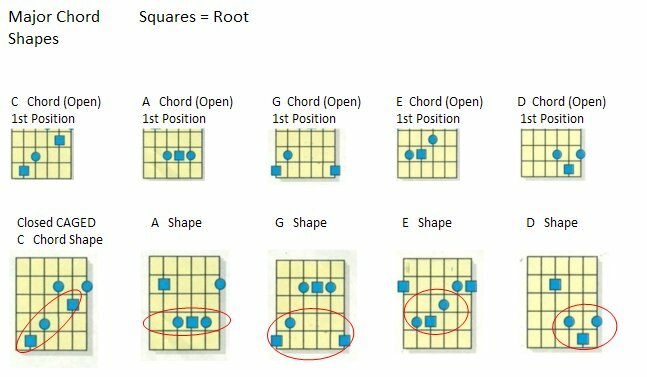 Root notes are square. Blues notes are blue. 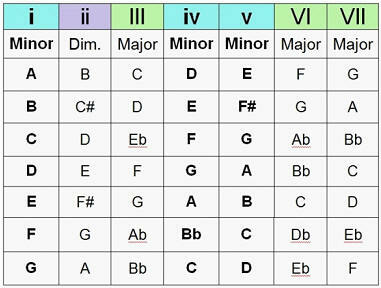 of C, the chord progression would be C/F/G, in the key of G the progression would be G/C/D. C/G/Am/F and in G it would be G/D/Em/C. bluegrass licks & bluegrass guitar chords are just for you.